2) In this context, the matter regarding fixation of pay under 7th CPC in respect of those employees promoted between 1st day of January, 2016 and the date of notification of CCS (RP) Rules, 2016 that is 25th July, 2016 and opted to switch over in revised pay structure from the date of next increment after availing the benefit of promotion in pre revised pay structure has been examined by Ministry of Finance, Department of Expenditure. It has since been clarified by the Ministry of Finance Deptt of Expenditure (E.III-A Branch) that the option to switch over to the revised pay structure either on 01.01.2016 or from a later date than 01.01.2016 i.e., on the date of promotion or the date of next increment, is applicable under.-Rule-5 - in case of post held on 01.01.2016. In other words, if the date of next increment on 01.07.2016 for a post held on 01.01.2016 falls after the date of promotion, then the date of next increment for the post held on 01.01.2016 has no relevance for option, as this post is no longer held on the date of next increment. 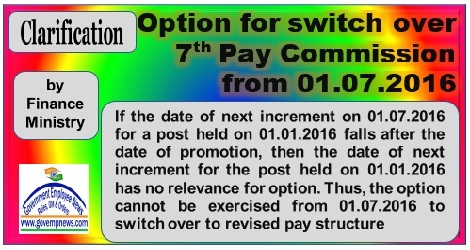 In view of the above, option cannot be exercised from 01.07.2016 to switch over to the revised pay structure in such cases consequent upon the implementation of 7th CPC. Copies of letters issued by the office of CGDA, UIan Batar Road, Plam, Delhi Cantt.-110010 including the one referred to supra are enclosed for ready reference.